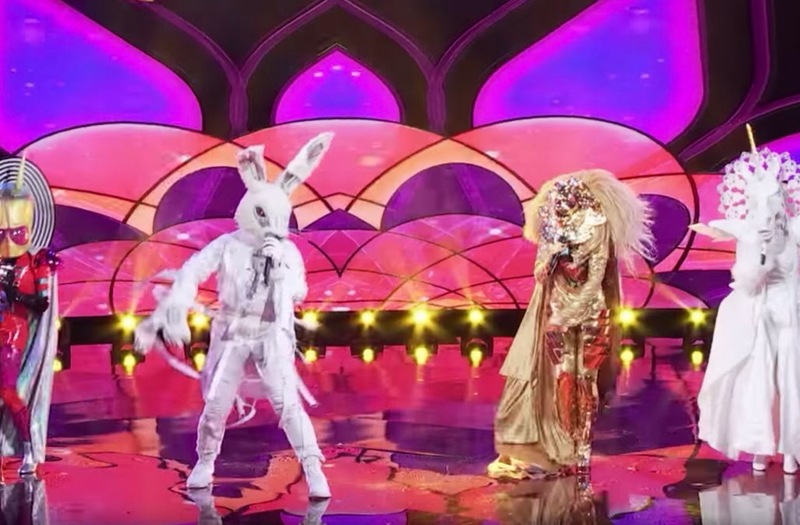 Episode 5 of The Masked Singer opened with a group performance by (from left) Alien, Rabbit, Lion, and Unicorn. The group rendition of “I’m On Top Of The World” by Imagine Dragons went well, and was followed by individual performances by each of the contestants. The use of “background dancers” by each performer is notable, with Alien’s dancers in UFO-inspired costumes, Rabbit dancing with a bevy of bunnies, and Unicorn performing with a red-clad pair eerily reminiscent of Thing One and Thing Two from Dr. Seuss. Rabbit’s dancing was again a crowd-pleaser, and he demonstrated an impressive set of pipes on the R&B inspired selection of Poison. Rabbit’s strategy has been to show his range with a different genre of music each performance, but I could have done without the country selection performed in his last outing. In this episode he was again where he worked well, and against someone like Rabbit, the other contestants appeared flat-footed. With fewest votes, Unicorn was voted off, and revealed to be…Tori Spelling, an identity correctly guessed by judge Dr. Ken Jeong. This entry was posted on February 1, 2019 at 8:36 am and is filed under animals, anthropomorphic, fantasy, furry, television. You can subscribe via RSS 2.0 feed to this post's comments. Now the “Rabbit” is supposedly into magic, producing a magician’s kit as an identifying clue item. Knowing this is an interest of yours, do you have any ideas for someone with boy-band moves and a side interest in magic? My first two guesses would be: either David Copperfield or Lance Burton. Both helped popularize the almost now-stereotypical use of vintage song-and-dance music to lend a dash of elegance to stage magic in general. My third (and admittedly wildest) guess would be someone who’s become almost the Harpo Marx of stage mages: Penn Gillette’s “silent” partner Teller!